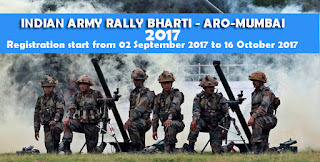 Home » Army Bharti » GD Rally Recruitment notification ARO Mumbai 2017. GD Rally Recruitment notification ARO Mumbai 2017. Indian Army organized rally recruitment for eligible candidates who are resident of Mumbai, Mumbai Suburban, Thane Palghar, Raigad and Nashik districts of Maharashtra. They are required to visit rally vanue to attened recruitment at "Manniya Shri Abdul Kalam Azad Sports Stadium" (Kausa Valley) Mumbai.District-Thane from 01 Nov 2017 to 11 Nov 2017.
what category to be screened in Rally Recruitment? 2.Soldier Clerk/ Store Keeper Technical. 4.Soldier Technical (Aviation & Ammunition Examiner). How to register Online for Indian army Rally Recruitment? 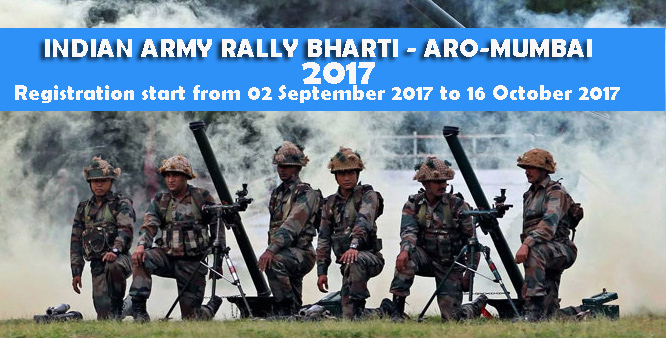 Candidates who wish to apply Indian army, must visit official website of Indian Army "www.joinindianarmy.nic.in" from 02 September 2017 to 16 October 2017. 1. Click on Aplly online under the "JCO OR Enrolment" at home page. 2. Click on Register if olready not register. Allready registered user need to use their username and passord. 3. If not registered, you need to valid email address and phone number to register.